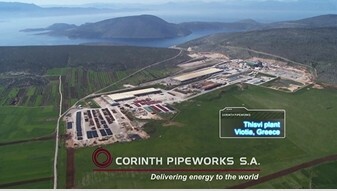 Corinth Pipeworks, Thisvi, Greece, 56" LSAW Pipe mill - Corinth Pipeworks S.A. The recently installed Longitudinal Submerged Arc Welded (LSAW) pipe mill (commissioning Q2 2015) has a capacity of 400.000Tn/y and is producing pipes with external diameters ranging from 16’’ to 56’’, wall thickness of up to 40mm, pipe lengths up to 18,3m and steel grades up to X100 using the JCOE manufacturing method. Hot rolled steel plates are used as the raw material. Highlights of the installation are the ‘Pipe Finishing Press’ (supplementing the main press) that will allow production of small diameter pipes starting from 16” with high wall thickness, targeting the deep offshore pipelines projects, the state of the art NDE systems as well as the ‘Pipe End Robotic Laser Measurement System’ that will provide full monitoring and recording of the advanced dimensional properties achieved with the new installation. With this investment, CPW is aiming to expand its product range in order to capture the fast growing global demand for high strength offshore and onshore energy pipes, which meet very strict quality criteria and thus offering a unique product range, and excellent customer service. Plain end, square cut or beveled. 750 Town and Country Blvd.